Bernard Johan Herman Haitink CH KBE (Dutch: [ˈbɛrnɑrt ˈɦaːi̯tɪŋk]; born 4 March 1929) is a Dutch conductor. 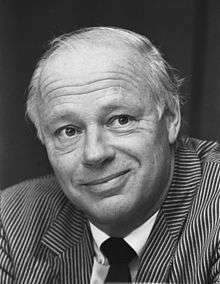 Haitink was born in Amsterdam, the son of Willem Haitink, a civil servant who was to become director of the Dutch electricity board, and Anna Clara Verschaffelt, who worked for Alliance Française. He studied the violin and conducting at the Conservatorium van Amsterdam. He played the violin in orchestras before taking courses in conducting under Ferdinand Leitner in 1954 and 1955. Haitink conducted his first concert on 19 July 1954 with the Netherlands Radio Union Orchestra (later the Netherlands Radio Philharmonic [RFO]). He became second conductor of the orchestra in 1955, and chief conductor of the orchestra in 1957. His conducting debut with the Concertgebouw Orchestra was on 7 November 1956, substituting for Carlo Maria Giulini. After the sudden death of Eduard van Beinum, Haitink was named first conductor of the Concertgebouw Orchestra on 1 September 1959. He became principal conductor of the Concertgebouw Orchestra in 1961, and shared that position jointly with Eugen Jochum until 1963, when Haitink became sole principal conductor. With the Concertgebouw Orchestra, Haitink made many recordings for the Philips label, and later Decca and EMI Classics, and toured widely with the orchestra. In the early 1980s, Haitink threatened to resign his Concertgebouw post in protest at threatened reductions to its subsidy from the Dutch government, which could have led to the dismissal of 23 musicians from the orchestra. The financial situation was eventually settled, and Haitink remained as chief conductor until 1988. In 1999, he was named the honorary conductor of the Royal Concertgebouw Orchestra. In December 2012, following his advocacy for the RFO in the wake of proposed budget cuts to the orchestra and Dutch music in general, Haitink accepted the title of patron of the RFO. In March 2014, Haitink stated to the Dutch newspaper Het Parool that he wished to renounce the title of RCO conductor laureate and no longer to guest-conduct the orchestra, in protest at the orchestra's current administrative management. In September 2015, the Royal Concertgebouw Orchestra announced a rapprochement with Haitink, with a scheduled guest-conducting engagement with the orchestra in the 2016-2017 season. Outside the Netherlands, Haitink was principal conductor of the London Philharmonic Orchestra from 1967 to 1979. Haitink also served as the music director at Glyndebourne Opera from 1978 to 1988. He was music director of the Royal Opera House, Covent Garden from 1987 to 2002, where he was praised for his musicianship, but received criticism for his degree of attachment to the entire organisation. From 2002 to 2004, Haitink was chief conductor of the Staatskapelle Dresden. His original contract with Dresden was through 2006, but Haitink resigned in 2004 over disputes with the Staatskapelle's Intendant, Gerd Uecker, on the orchestra's choice of successor. London, Barbican Hall, Bernard Haitink and the London Symphony Orchestra. Haitink served as principal guest conductor of the Boston Symphony Orchestra from 1995 to 2004, when he took on the new title of conductor emeritus. In addition, he has appeared with l'Orchestre National de France and the London Symphony Orchestra. In the early 2000s, he recorded the complete Beethoven and Brahms symphony cycles with the London Symphony Orchestra (LSO) for the LSO Live label. Haitink is an honorary member of the Berlin Philharmonic. In April 2006, after an acclaimed two-week engagement in March 2006 with the Chicago Symphony Orchestra (CSO), the CSO appointed Haitink to the newly created position of principal conductor, effective as of the 2006–2007 season. The duration of the contract was four years. Haitink had declined an offer from the CSO to be music director, citing his age. With respect to this contract, Haitink stated that "every conductor, including myself, has a sell-by date." He concluded his Chicago principal conductorship in June 2010 with a series of concerts of the complete Beethoven symphonies and being awarded the Theodore Thomas Medallion by the orchestra. Haitink has conducted and recorded a wide variety of repertoire, with the complete symphonies of Beethoven, Brahms, Schumann, Tchaikovsky, Bruckner, Mahler, Shostakovich and Vaughan Williams, and the complete piano concertos of Beethoven and Brahms with Claudio Arrau notable among his recordings. Haitink has made many recordings for several labels, including Philips Records, EMI Classics, Columbia Records, LSO Live, RCO Live, and CSO Resound. Other recordings include the complete orchestral works of Debussy, the two symphonies of Elgar, the three Mozart/Da Ponte operas, and Wagner's complete opera cycle Der Ring des Nibelungen, and the opera Tannhäuser. Haitink formally stated in a 2004 article that he would no longer conduct opera, but he made exceptions in 2007, directing three performances of Parsifal in Zurich in March and April and five of Pelléas et Mélisande in Paris (Théâtre des Champs-Élysées) in June. He stated in 2004 that he did not plan to conduct again at the Royal Opera, Covent Garden. However, an April 2007 announcement stated that Haitink would return to the Royal Opera in December 2007, with the same Zurich production of Parsifal, and he fulfilled this engagement. More recently, Haitink has led master classes in conducting for young conductors in Lucerne for several years. In June 2015, the European Union Youth Orchestra announced the appointment of Haitink as its conductor laureate, effective immediately. Haitink resided in Lucerne, Switzerland, in 2009. Mahler: Symphony No. 2 "Resurrection", Elly Ameling, Aafje Heynis, Netherlands Radio Chorus, (Philips 1968). Shostakovich: Symphony no.15 (RCO live 2012). ↑ Nicholas Wroe (14 October 2000). "Master of the House". The Guardian. Retrieved 21 April 2007. 1 2 "Haitink patron of the Netherlands Radio Philharmonic Orchestra" (Press release). Radio Filharmonisch Orkest. 20 December 2012. Archived from the original on 6 August 2013. Retrieved 2 February 2013. ↑ "The Diffident Dutchman". Time. 12 May 1967. Retrieved 13 July 2007. ↑ The orchestra's own website gives 1963 as the date when Haitink became sole principal conductor. ↑ James R. Oestreich (10 March 2002). "An Eminently Rational Man in an Irrational Profession". New York Times. Retrieved 30 October 2007. ↑ "Haitink nooit meer bij Concertgebouworkest". Het Parool, 4 March 2014. ↑ "Press Statement - Royal Concertgebouw Orchestra and Bernard Haitink" (Press release). Royal Concertgebouw Orchestra. 2 September 2015. Archived from the original on 18 October 2015. Retrieved 2015-09-03. ↑ Guido van Oorschot (2015-09-03). "Concertgebouw toont zich de wijste in kwestie-Haitink". De Volksrant. Retrieved 2015-09-03. ↑ Nicholas Kenyon (2 June 1991). "For a Reluctant Maestro, Relief, No Regrets, in Berlin". New York Times. Retrieved 6 January 2008. ↑ Andrew Clements (21 June 2002). "A great musician – but that was not enough". The Guardian. Retrieved 21 April 2007. ↑ Andrew Clark (22 October 2004). "Bernard Haitink: unfinished symphony". Financial Times. Retrieved 5 May 2007. ↑ Andrew Patner (15 October 2006). "Symphony in good hands". Chicago Sun-Times. Retrieved 21 April 2007. ↑ Daniel J. Wakin, (28 April 2006). "Arts, Briefly; Chicago Symphony: Conductors but No Music Director". New York Times. Retrieved 21 April 2007. ↑ Geoffrey Norris (9 April 2008). "Bernard Haitink: I love power without responsibility". The Telegraph. Retrieved 10 September 2008. ↑ James R. Oestreich (6 October 2006). "A Jet-Setting Maestro Sets a Brisker Pace for Beethoven". New York Times. Retrieved 21 April 2007. ↑ Andrew Patner (19 June 2010). "Haitink wraps up CSO tenure with revealing Beethoven's Ninth". Chicago Sun-Times. Retrieved 2 July 2010. ↑ "CSO Principal Conductor Bernard Haitink Receives Theodore Thomas Medallion for Distinguished Service" (PDF) (Press release). Chicago Symphony Orchestra. 21 June 2010. Retrieved 2 July 2010. ↑ Anderson, Robert; Mahler; Soloists; Choirs; Orchestra, Concertgebouw; Haitink (1973). "Mahler: The Complete Symphonies". Musical Times. Musical Times Publications Ltd. 114 (1560): 152. doi:10.2307/957200. JSTOR 957200. ↑ Martin Kettle (5 March 2004). "I started far too young. I still have sleepless nights ...". The Guardian. Retrieved 21 April 2007. ↑ "Breaking News: Next Royal Opera Season Promises Minotaur Premiere, New Salome, Voigt as Ariadne" (Press release). Opera News. 10 April 2007. Retrieved 23 July 2007. ↑ Erica Jeal (8 December 2007). "Parsifal (Royal Opera House, London)". The Guardian. Retrieved 6 January 2008. ↑ Tom Service (2011-08-11). "A masterclass with Bernard Haitink". The Guardian. Retrieved 2014-10-04. ↑ "EUYO announces new conductors" (Press release). European Union Youth Orchestra. 2015-06-29. Retrieved 2015-09-03. ↑ Tom Service (22 September 2009). "The passion and pain of Bernard Haitink". The Guardian. Retrieved 2 July 2010. ↑ "Queen honours conductor Haitink". BBC news. 9 July 2002. Retrieved 21 April 2007. ↑ Fiona Maddocks (13 December 2009). "Mahler Symphony No 2: Chicago Symphony/Haitink". The Observer. Retrieved 27 October 2010. ↑ "Chicago Symphony Orchestra Announces Major Radio And Recording Initiatives". Chicago Symphony Orchestra. 30 November 2006. ↑ John von Rhein (20 October 2006). 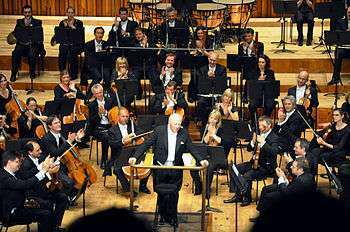 "Haitink, CSO make magic with Mahler". Chicago Tribune. Retrieved 21 April 2007. ↑ Andrew Clements (25 April 2008). "Mahler: Symphony No 6, Chicago Symphony Orch/ Haitink". The Guardian. Retrieved 27 October 2010. ↑ Andrew Clements (22 August 2008). "Classical review: Shostakovich: Symphony No 10, LPO/Haitink; Symphony No 4, Chicago SO/Haitink". The Guardian. Retrieved 27 October 2010. ↑ Andrew Clements (17 June 2010). "Strauss: Ein Heldenleben; Webern: Im Sommerwind". The Guardian. Retrieved 27 October 2010. Wikimedia Commons has media related to Bernard Haitink.